Hi all - It's often difficult to get quality Japanese movies in Adelaide - or Australia for that matter. At least legally. Movies tend to be either anime or offbeat (please tell me you haven't watched RoboGeisha). Anyhow, we try to buy movies when we return to Japan, but I have to admit that DVD's are incredibly expensive in Japan. Don't ask me why, but movies will often cost 3-5000 yen...or $35 - 60AUD - as compared to around $15 - $35AUD here in Australia. In fact it can be cheaper to buy Japanese movies here for some reason. So our choices are a little limited... but T-chan and I often enjoy sitting down watching Japanese movies together - all sorts of Japanese movies. 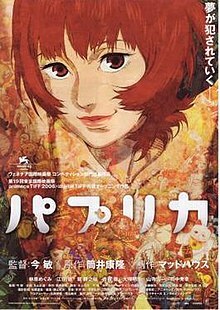 Tonight I thought I'd jot down a very very quick review of a movie we just watched on DVD tonight, an anime called Paprika, by Satoshi Kon. Satoshi was the director of one of my favourite anime, Tokyo Godfathers, which I might review at some other time. I'm not a big anime fan, but enjoy them occassional. The ones I particularly like are the ones that take a detour from the path well trodden. And that's definitely the case with Paprika. This movie is part psychological thriller (aka Hitchcock does anime), and part psychedelic existential deconstruction of reality (Hitchcock does anime on crack). It's about an invention that allows people to share their dreams. Whilst still in it's developmental phase, several devices are stolen from the research facility where Chiba Atsuko is working in the real world, and from where her dream alter ego Paprika has been given birth. Together they must solve the mystery of the thefts, whilst simultaneously unravelling the mystery that surrounds a Detective Toshimi Konakawa's recurring nightmares. Into this mix is the crazy research professor Toratarō Shima, and brilliant though immature Kōsaku Tokita, inventor of the device. The movie may not be as endearing as Tokyo Godfathers, but it showcases Satoshi's technical skills and ebullient imagination. The blending of "reality" and dream sequences are amazing - and there's some magical moments there (anyone who's a fan of Monkey will have a laugh). The music upbeat and yet highly textured is composed by Susumu Hirasawa, and the songs actually featured a vocaloid, or artificially generated female voice. Overall, I'd give this a 3.5 popcorns out of 5. It's brilliant animation and hypnotic dream sequences are creative and inspiring, with only the fairly shallow character development being a little disappointing. It's most definitely NOT a childrens movie as there's some disturbing sequences and also some sexual content. On a sad note however, the director Satoshi Kon was diagnosed in May 2010 with advanced pancreatic cancer and died in August the same year at the young age of 46. His brilliance an characteristic unconventionality will be sorely missed. I've been meaning to watch this movie. I saw a part of it on tv and decided I'd stop watching because I needed to watch it from the beginning. It's definitely worth watching, and some of the technical work is truly amazing. It's such a shame that he passed away so young as he had so much to offer the world of art and entertainment.